Rivers and airport seems to be diggin in creating cracks. Perhaps some elevation data is wrong or flattening is in place. a distance away from it. Please have a look!! No other mesh or ortho is installed, pure vanilla. ENDU Without "Aerosoft - ENTC Tromso - Mesh"
ENDU With "Aerosoft - ENTC Tromso - Mesh"
One could say "works as designed". It's a common problem of sceneries with custom mesh and not only happens with ENTC but all other tiles with multiple airports on it. If the flattened area is not wide enough try to extent the airport boundary in WED. 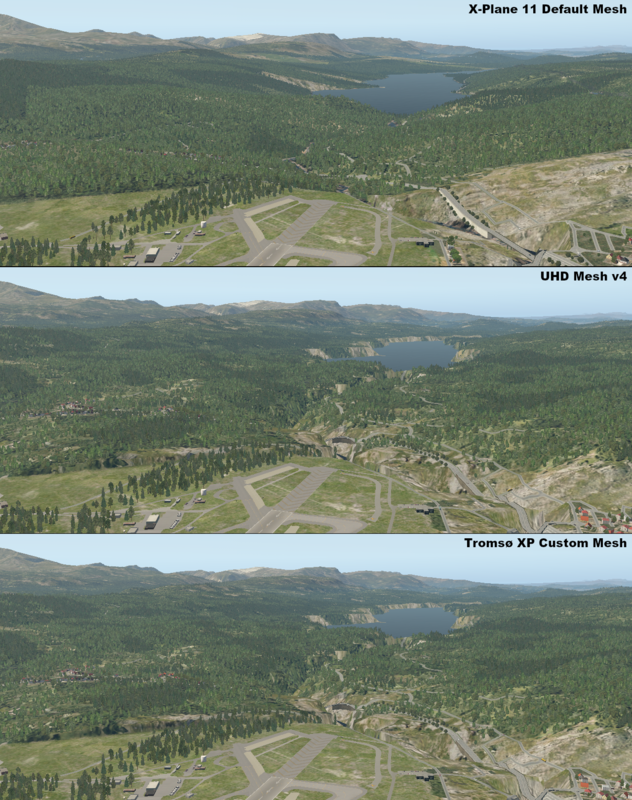 In more detail: The Tromsø XP Custom Mesh is based on the UHD Mesh v4 and that UHD mesh has the shown mesh-artifacts at ENDU. In other words: The base mesh for the custom mesh-version causes the shown issue at ENDU, not the custom edit itself. See also the attached comparison. Thus I'd like to adapt Marten's comment and say: "works as _initially_ designed". Hi, that much I have figured out too.. I will talk to Andras to see if he can fix it. I believe I have narrowed the bug down to "river elevations" or perhaps the tag "streams"
I have checked ENEV and ENAN which are the nearby airports, but it seems to be only ENDU that have the actual airport effected, again of course due the fact that there is a "river" or a "stream" coming down towards the airport boundary. The cracks can be seen all over the tile as seen in these two images. Will try this, but if it does not work I think the best solution is then to remove Aerosoft ENTC for good. 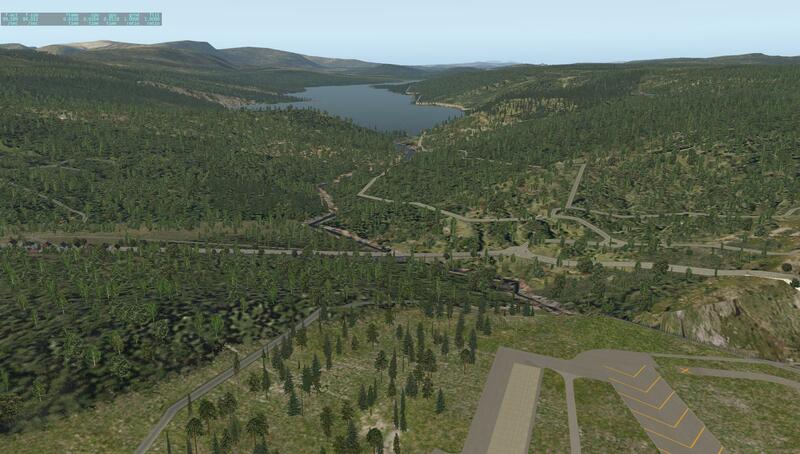 Not worth having an FSX converted airport present in XP if neighbouring mesh/airport is ruined. Better then to make the airport from scratch again and edit the default dsf tile. But I think it is important that people know about this problem, just in case they are thinking about buying it, it is in the end a payware product. You are the first reporting the ENDU problem although that might be the more popular airport. I would guess most of the people wouldn't buy ENTC anyway because they prefer flying to ENDU with a better scenery. Though not as trafficated as ENTC with only 242.000 pax in 2017 vs 2.104.861 at ENTC (which is a way larger city), it is still a important airport for both military and domestic travels in this region. While not everybody takes time to report, the fact is that there is an issue that cannot be fixed in this payware scenery and people need to be aware. The correct way is that the thirdparty vendor list this detail in their readme or on the product page as a known bug. That way the end user is informed in a responsible fashion. From Alpilot's response, too bad he quit doing mesh.. In some very rare cases, the river smoothing / flattening algorithm goes haywire. Yes, riverbeds need to be take care of via some algorithms as the original DEM (elevation) data is rarely optimal along narrow valleys OR the OSM river vector data is not perfectly in sync with the DEM data. An algorithm tries to “correct” these issues, but in some – rare – extreme cases it can be too aggressive in the wrong place. This is very, very hard to take care of thus I accept it “as is”. 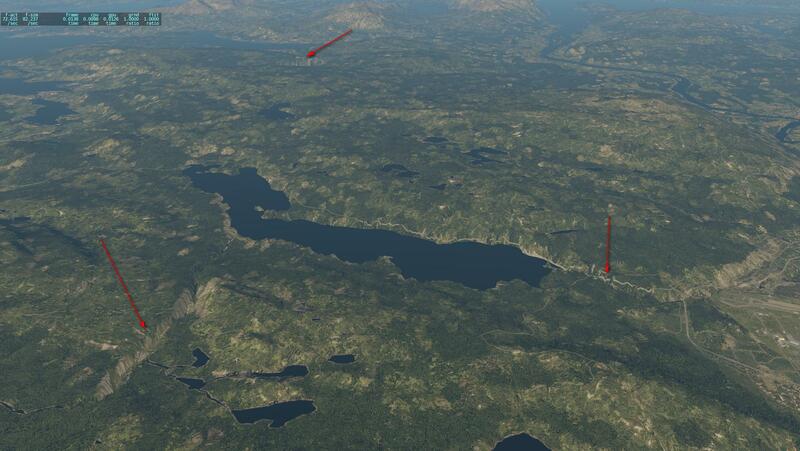 Not worth having an FSX converted airport present in XP if neighbouring mesh/airport is ruined. Better then to make the airport from scratch again and edit the default dsf tile. 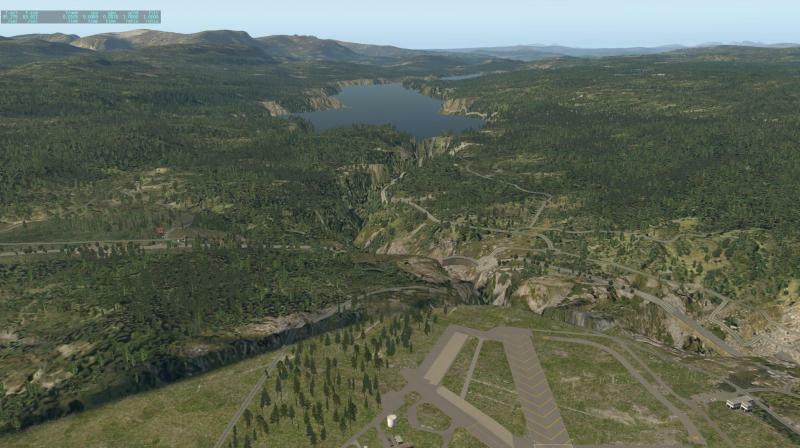 Just for the record: This is a mesh problem and has nothing to do with the airport itself - you could create all Tromso content from scratch and it would not change anything here. Further, it's not relevant if any aiport originally was created for FSX and then ported to X-Plane. X-Plane does not have any compatibility modes for FSX sceneries so everything you see in any XP scenery is native X-Plane tech. 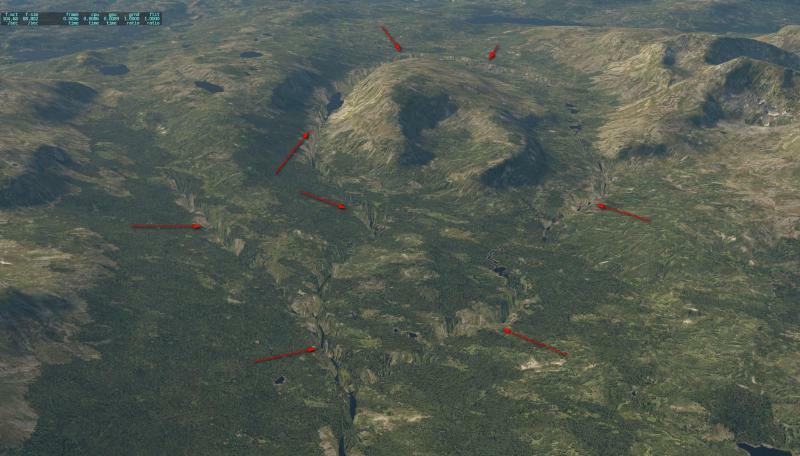 The objects don't care if you first export them for FSX and then for X-Plane later, doing a so called 'conversion' results in a native XP scenery and is not any better or worse than 'creating a scenery from scratch' - the latter just takes additional time.